Read how one community grew vegetables, connected neighbors and even shed a few pounds just by transforming a 12-by-9-foot strip of land. Emily Organ had been growing vegetables on the strip of land between the street and sidewalk outside her home in the Victory neighborhood of northwestern Minneapolis for years. 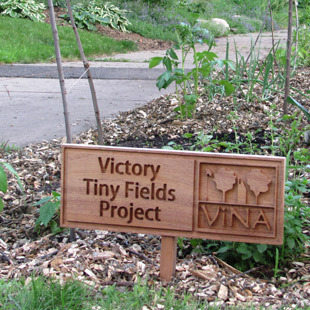 Then in 2013, she decided to get her neighbors to join in and convinced her neighborhood association to fund the Victory Tiny Fields Project. Participants received compost, gardening tips, seeds and seedlings to plant a 12-by-9-foot space. It was a huge success. “The project really opened my eyes to the joys of eating fresh vegetables,” says Paul Schulz, who was initially skeptical. “They tasted better than anything in the store.” A more tangible benefit: his family’s grocery bill decreased 40 percent when the garden was at its late-summer peak. Lynn Keillor jumped at the chance to turn her trash-filled boulevard into a garden. She even lost a few pounds. (She figured it was because she was eating more veggies.) Perhaps one of the greatest successes was connecting neighbors by bringing gardens street-side. “When people talk to each other they build a network that roots them more closely to the neighborhood,” notes Diane Spector, chair of the Victory Neighborhood Association. Organ hopes to eventually expand the program across the country.